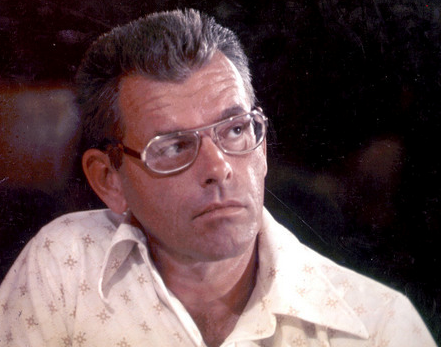 Although I'm interested in Phoenix history, and post images on a Facebook page, I'm reluctant to post about Don Bolles, an investigative reporter for the Arizona Republic who was murdered in 1976. The internet being what it is, it seems to attract the kind of comments that show disrespect for Don, his family, and his friends. So I won't talk about Don Bolles. But I would like to encourage you to learn more. And the best place to start is the lobby of the Clarendon Hotel, which is on 4th Avenue between Indian School Road and Osborn. I've been there several times on June 2nd, with a friend of mine who has great expertise, and great respect, for the story of Don Bolles. And if you go there then you will probably see people who remember Don, and 1976. No, there's no meeting or anything, no speeches, just people paying respect for the time, the place, and the man. Walk into the lobby and look to your right - there's a small bust of Don Bolles. No, the Clarendon isn't glorifying what happened there, but it's also not turning its back on the history. Walk along the hallway towards the restrooms and look at the enlarged photos, and see what happened there. I'm still learning about this, as I am still learning about the history of Phoenix. Brad, do you know the exact spot his car was at when the crime occurred? I work near The Clarendon and I've driven around there a few times and I've never seen a marker or even flowers on June 2nd. Like you said, I'm not in any way glorifying the crime, but I'm very interested in Phoenix history and events good & bad, and for detail & accuracy sake I've always wondered exactly where on the property the crime occurred. Hi Paul - the explosion happened in the parking lot just south of the building. 5th parking space in from the east -extreme north side - right near the side entrance.